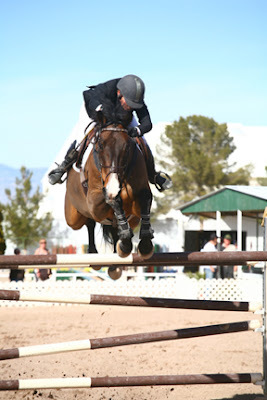 Elani Rager and Castor on course in Sunday's $25,000 HITS Grand Prix, presented by Pfizer Animal Health, at the Kachina Classic in Tucson, Arizona. TUCSON, AZ (February 17, 2011)—During last week’s Kachina Classic at the HITS Arizona Winter Circuit in Tucson, Arizona, New Mexico’s Elani Rager made it two in a row when she captured the $25,000 HITS Grand Prix, presented by Pfizer Animal Health, aboard Lisa Upplegger’s Castor for the second consecutive week. Sunday’s class featured a course set by Cecilia Galvan of Katy, Texas that challenged riders with a triple combination and a water jump early in the track, and finished with a line that had an oxer requiring a tight turn to a double combination to a high vertical to a wide oxer. Galvan put 88 seconds on the clock for the first round. Bjorn Ikast of Laredo, Texas and his own Iz’s Viva La Vida were the first pair to take to the field and had a rail down at the second fence for four faults, which kept them from advancing. Ikast had four other mounts in the class and would be back to the ring soon enough for more shots at the course. The first clear effort came five trips later after the next few riders to take to the field suffered numerous faults throughout Galvan’s course. Allison Kroff of Green Valley, California and her own Washington made their way around the course flawlessly, in what seemed like it was going to be the only clear round of the afternoon. Two trips later Ikast returned on Brave Heart and appeared to be on his way to forcing a jump-off, but heartbreak came for the pair at the final fence when the rail came down as they crossed the timers in 83.789 seconds. When the class was complete, Ikast and Brave Heart finished in fourth place. 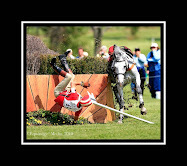 Rails continued to fall, and just when the crowd began to doubt the possibility of a jump-off, Rager and Castor, high from their victory last week, entered the ring next. The team navigated the course with ease, ensuring a jump-off with just one rider left to show in the first round. Ikast finished the first round strong with his first clear effort of the afternoon aboard Bovee Limited Liability’s Colorado, making it three in the jump-off. Galvan’s short course featured seven obstacles, including the water jump, and the double combination that proved so troublesome in the first round, with a time-allowed of 47 seconds. Kroff and Washington went first in the jump-off and raced through the track in 39.537 seconds setting the Great American Time to Beat. Rager and Castor followed and were able to shave more than two seconds off Kroff’s time to take the lead. Ikast and Colorado followed but were unable to take the lead when they had a fault at the water jump, opting to retire from the course they settled for third place. Rounding out the top five was Mark Mead of Longmont, Colorado and Marianne Marshall’s Balthazar. 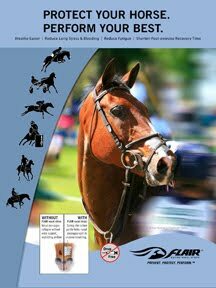 With the win, Rager now has $15,000 in prize money on Castor and two of the eight Grand Prix needed to become eligible for the Pfizer $1 Million Grand Prix. The current Pfizer Million Rankings has Rager in seventh place with Ikast and Colorado in the number 19 spot. Oregon’s Rich Fellers currently holds the number one spot aboard famous World Cup mount Flexible, owned by Harry and Mollie Chapman. Elani Rager and Castor in the winner's circle after their victory in Sunday's $25,000 HITS Grand Prix, presented by Pfizer Animal Health, at the Kachina Classic in Tucson, Arizona. Julia Dotoli joins owners Lisa Upplegger, Jurgen Upplegger and Bonnie Livermore for the presentation. High-Performance riders showing at HITS Arizona this winter will have four more opportunities to get an early jump on qualifying for this year’s Pfizer Million, which will take place on September 11 at HITS-on-the-Hudson in Saugerties, New York. On Saturday, Mark Mead, who finished fifth in the Grand Prix, led the way in the $2,500 Devoucoux Hunter Prix when he piloted Linda Vellman’s Socrates to a victory in the featured Hunter class at the Kachina Classic. Brian Post of Phoenix, Arizona set a beautiful course that featured options with inside and outside turns, a split rail, hay bales and natural fences to replicate the elements from the traditional hunt field. Mead and Socrates earned an 83 for the first round, the highest of the class, and a 79 in the handy for a total of 162 to win the class. 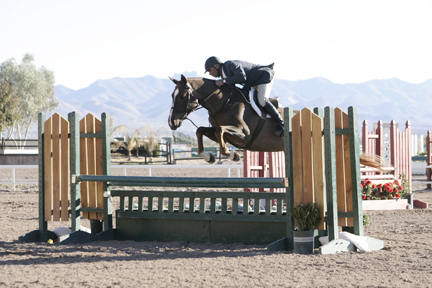 Gretchen Lof of Cave Creek, Arizona scored an 80 aboard her own Dresden in the first round, paired that with a score of 79.5 in the handy, for a total of 159.5 for the second-place honors. Third place went to Colorado’s Michael Dennehy and Sir Topham Hat, owned by The Cottonwoods LTD, after they earned a score of 80 in the first round, a 78 in the handy, for a total of 158. 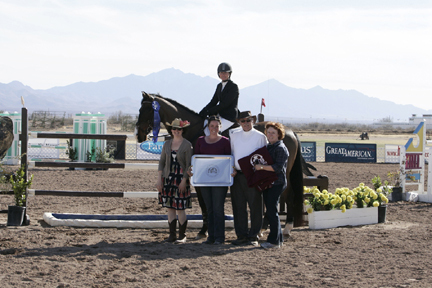 Katherine Pitts of Centennial Colorado took fourth place with a total score of 141 aboard her own Agassi, and Meredith Houx-Remiger of Albuquerque, New Mexico finished in fifth with a total score of 134 aboard McKinnon Roberts’ Capiche. Mark Mead and Socrates in the $2,500 Devoucoux Hunter Prix at HITS Arizona. 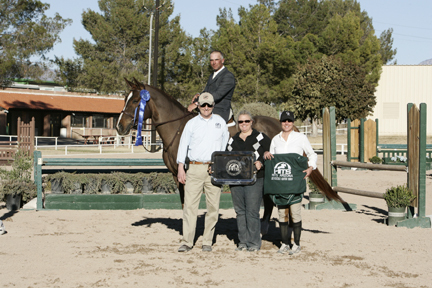 Joe Dotoli of HITS presents the award to Mark Mead and Socrates for their win the $2,500 Devoucoux Hunter Prix at HITS Arizona. Joining for the presentation are trainer Tracye Ferguson and owner Linda Vellman.